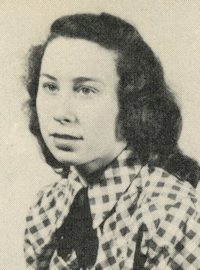 Obituary – Harris, Joan Elaine (Pratt) « Perry High School Alumni Association, Inc.
﻿Band 45-48, Student Council 45-46, National Honor Society 46-48, Junior Play 46-47, Annual Staff 45-48, Annual Editor 47-48, Y-Teens 46-48, Y-Teen Treasurer 47-48, National Honor Society Sec. 47-48, Student Director of Annual Follies 46-47, Assistant Editor of Annual 46-47, Who’s Who in American High Schools 47-48. Joan E. Harris, 69, of Littleton, CO died April 4, 1998. Services were April 8, with burial at Littleton Cemetery. Mrs. Harris was born to Floyd W. and Clarice L. (Robinson) Pratt in Norman, Okla., on Jan. 16, 1929. She married Ronald Harris in 1950. She was retired. She was a member of the Assistance League of Denver. Survivors include her husband; sister Peggy Wheeler of Colorado Springs; sons Ron of Littleton, Scott of Denver; daughters Juhree of Littleton, Suzi Downing of Pennsylvania; three grandchildren.